Every single exercise which requires stabilization of your upper body works your rotator cuff to some extent. Rotator cuff strengthening is important and involves all four muscles of the rotator cuff. Rotator cuff strengthening is so important because an injury to the rotator cuff will cause pain during most upper body exercises and may even make them impossible to perform. The diagram on the right is a 3/4 side view of the rotator cuff musculature. The rotator cuff tendons are colored. The chart is omitting the deltoids and pectorals which cover the rotator cuff muscles. 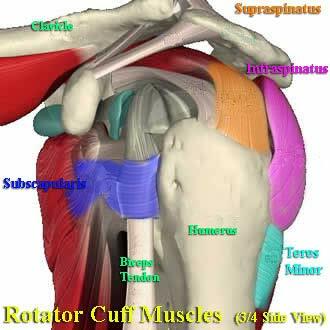 The supraspinatus is the most commonly injured rotator cuff muscle. It is responsible shoulder abduction, which is the motion of lifting your arm out to the side. The infraspinatus is the largest rotator cuff muscle. The primary motion of the infraspinatus is to externally rotate your humerus. If you put the palm of your hand on your belly button and then bring your forearm out to the side while keeping your elbow tight to your body, your humerus will externally rotate. The teres minor is on your back right under your armpit. The teres minor works with the infraspinatus to externally rotate your humerus. The teres minor is active for rotator cuff exercises as well as back exercises for the lats. The subscapularis is responsible for internal rotation of your humerus. If you take your hand off your mouse and touch your chest, your humerus will internally rotate. When you move your arms with or without resistance, your rotator cuff muscles activate to help stabilize and hold your humeral head in the socket. Remember, your arm itself weighs something, so even without weights, your rotator cuff muscles are still under tension to support the motion of your arm at the shoulder joint. A system is only as strong as its weakest link. In the shoulders, the weakest link is the stabilization system, the rotator cuff. Every muscle in your rotator cuff works together to stabilize your shoulder. In order to perform effective exercises for your upper body, your rotator cuff must be healthy. This is important now and down the road. If you have an injury to your shoulder and you think it is your rotator cuff, you should see doctor or a physical therapist rather than self-diagnose a rotator cuff injury. It is always better to be safe than sorry with your rotator cuff. Your physical therapist may prescribe specific rotator cuff stretches or rotator cuff strengthening exercises. If you get a rotator cuff injury, all exercises for your upper body could be painful for your shoulder and possibly further damage your rotator cuff muscles. Since rotator cuff strengthening and rotator cuff exercises are not a very common practice, the rotator cuff muscles are underdeveloped in many people. Muscle imbalances, such as protracted shoulder girdle, can increase the chance of rotator cuff injury. The combination of dysfunctional rotator cuff muscles and overdeveloped shoulders, chest and arm muscles cause the muscle imbalances which increase the likelihood of rotator cuff injury. Rotator cuff muscles are most often injured because they finally succumb to chronic stress due to the cumulative injury cycle. If there is undue stress on the rotator cuff due to improper biomechanics or improper exercise form, impingement syndrome may develop. It’s fairly common to see the larger, more showy muscles being strength trained while stabilization system is neglected. In this situation, the larger upper body muscle groups such as chest and back being strengthened while the person neglects any rotator cuff stretches or rotator cuff exercises. As their larger muscle groups get stronger, they lift heavier and heavier weights that the stabilization system just isn’t prepared to handle, and injury is the inevitable result. Rotator cuff impingement syndrome has symptoms such as pain, weakness and immobility of the shoulder joint. Rather than trying to explain the complicated mechanism of rotator cuff impingement, it is more practical to focus on how to prevent injury. You have most likely heard about rotator cuff injuries from athletes or former athletes. Rotator cuff injuries are most common among baseball pitchers. Baseball pitchers provide a perfect example of importance of proper exercise form. A pitcher throws a baseball and propels it 90+ miles per hour toward home plate. The pitcher’s arm and the baseball (both are forms of resistance) are thrown forward at a tremendous velocity. The rotator cuff is responsible for decelerating the arm and holding it in the socket along with the glenoid labrum. Improper pitching mechanics can increase the chance of injury due to increased demand on the rotator cuff. A rotator cuff tear can happen because the muscles in the rotator cuff contract in an attempt slow down the arm, but come up against more force than the muscles can handle. If a Pitcher Can Tear the Rotator Cuff with the Mass of Their Arm, What Does that Tell You About Weight Training ? You probably already know what is coming next. If decelerating a pitcher’s arm produces enough force to tear the rotator cuff, it should be obvious what a 50-pound barbell can do. The eccentric or negative part of the repetition is when the rotator cuff accepts most force. If you do not slow the weight down with larger muscles, slowly, you put the rotator cuff at risk for tears and rotator cuff impingement syndrome. You must always lower the weights under complete control. However, even if you lower the weights properly, poor exercise selection can still cause rotator cuff problems. If your shoulders are sore or tender, never perform any exercises which aggravate them. It is always a good idea to avoid chest exercises and any other exercises which involve shoulders after your shoulder workout for a couple days. If you have healthy shoulders, you may want to work on strengthening your rotator cuff. Some people swear that strengthening the rotator cuff muscles has improved their performance during many different lifts, including the bench press and shoulder press. If you have shoulder problems, you should see a doctor or physical therapist before you do any rotator cuff exercises. Tube external rotation directly works the teres minor and infraspinatus. This is one of the most commonly prescribed rotator cuff exercises. 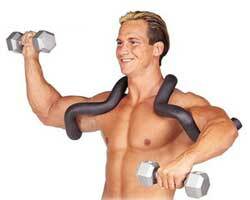 External rotation is one of the weakest links for most people, so you may find it necessary to use a light tube. Start: Position a resistance tube a few inches above waist level. The correct height of the tube should be exactly the same height as your elbow while your arm hangs at your side. Grab the end of the tube and walk out away from the origin of the resistance. Hold the handle at your belly button, and stand where there is slight resistance. Begin the motion: Keep your upper arm relaxed. Your elbow should not abduct or raise away from the side of your body for the duration of the motion. Slowly externally rotate your arm. Before the use of resistance tubes was widespread, physical therapists used to prescribe dumbbell exercises for one of the weakest motions of your upper body. Lying dumbbell external rotation is a shoulder strengthening exercise for your posterior deltoids and a rotator cuff strengthening exercise for your teres minor and infraspinatus, the second most commonly injured rotator cuff muscle. Start: Lie either on the floor or a weight bench with your upper arm at your side. Your elbow should be at your hip and directly below your shoulder. Begin the motion: Keep your elbow against your side so your deltoids are as relaxed as possible and slowly externally rotate the dumbbell as far as it goes. Pause for a split second and slowly lower the dumbbell back to the original position. Standing tube internal rotation is the best way to isolate your subscapularis. Your pectoralis major muscle also plays a large part in the internal rotation of your humerus, so it is important to perform these rotator cuff exercises with proper form. 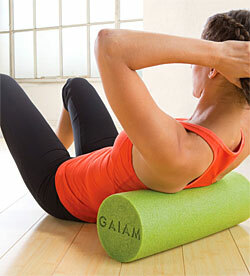 Start: Position a resistance tube or thera-band at around the same level as your belly button. Grab the handle and walk away until there is no slack left in the tube. Your elbow should be at your side with your arm out sideways. Begin the motion: Slowly internally rotate your arm until your palm of your hand touches your belly button. Slowly let your arm externally rotate back to the original position under resistance. You can walk away from the tube to increase the resistance if you chose a resistance which is too easy for around 20 reps. If you do not have a surgical tube or thera-band you can perform internal rotation with a dumbbell seated on a weight bench. Internal rotation rotator cuff exercises are shoulder strengthening exercises for the subscapularis. It is also a shoulder strengthening exercise for your anterior deltoid. Start: Lie on your side on a weight bench. Position your lower arm slightly in front of your body with a light dumbbell. Begin the motion: Try to keep your elbow relaxed against the bench and let your arm externally rotate as far as it naturally does below the level of the bench. Slowly internally rotate your arm and raise the dumbbell until your arm is about perpendicular to the floor. Make sure you lower it very slowly back to the original position and repeat. It so important that I’ll mention it again: In order for rotator cuff exercises to be effective, you must go through the range of motion slowly and under control. If you have rotator cuff problems in the past, you will most definitely benefit from the rotater, which will allow you to perform rotator cuff stretches correctly. If you don’t want to spend all day in the gym, here are the most effective shoulder exercises which are best for a full body workout to increase your metabolism and burn more calories. Here are 3 simple shoulder exercises that you can perform to help avoid injuries. Learn about the The “Weak Side Rule” and more from Vince Del Monte. Did you know that exercises on the stability ball can help you strengthen your rotator cuff? Some exercises on stability balls may be rotator cuff exercises because your shoulder stabilization will be tested thoroughly.